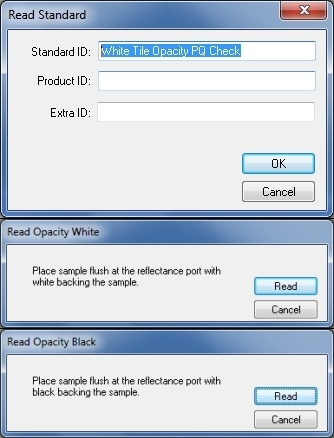 Contrast Ratio Opacity measurement quantifies how opaque a sheet sample using two readings. One reading is taken with the black glass or light trap backing the sample at the port. The second reading is taken with the sample backed by a white tile or the white sample clamp insert. EasyMatch QC will prompt you for the proper backing when taking opacity measurements. To perform opacity measurements in EasyMatch QC, first standardize the instrument in a reflectance mode. 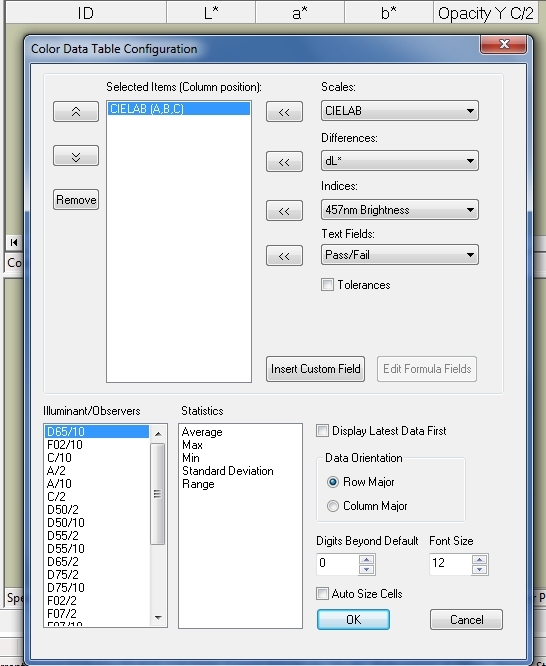 Once standardized in reflectance, select “Opacity” to display in the Color Data View by going to Options/Read Method’. Y Brightness value of the sample backed with the white backing which can be used to indicate the overall reflectance or luminous brightness as additional optical information. Y Brightness value of the sample backed by black backing which is the second component of the Contrast Ratio Opacity calculation. A typical display is just Opacity with some users selecting the Opacity, Yw combination. 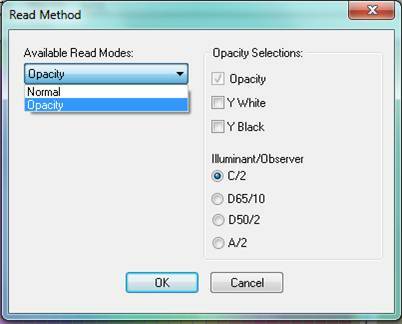 Another option is the choice of an illuminant and observer for opacity reporting. Chose C/2 if you have no prior conditions. Once all of your selections are made click ‘OK’ to save and these metrics will be displayed in your Color Data View. Put your mouse over the Color Data View/Right Click/Configure to select additional metrics such as CIE L*, a*, b* D65/10 color values as a complete quantifier of the color, or Yellowness Index E313 C/2 or D65/10 as a single quantifier for yellowness of white materials. Different metrics provide different optical information. Color values quantify the color of the sheet; contrast ratio opacity quantifies how opaque the sheet material is. Configure the Color Data View for additional metrics and simplify the display. Note that when measuring opacity the color values displayed in the color data table represent the sample reading with the white backing. Standardize the instrument on its normal black and white standards. As a PQ Performance Qualification Step, it is recommended that you read back the White Tile as a standard to verify everything is set up correctly. The White Tile is, by definition, an opaque material and should read a Contrast Ratio Opacity of 1100%. For your White Tile, the opacity should be 100% and the color values should be similar to the example below. If you get this response, you are performance qualified to continue to read contrast ratio opacity of near opaque sheets. These samples should be read lower than the tile, but typically above 85%. FAQ: Could you please recommend a source for opacity standards? Or can HunterLab provide them? I am not aware of a source for Opacity Standards. The typical way that a client would validate that the instrument is distinguishing different degrees of Opacity would be to measure a White Tile (should be 100% as it is opaque); then measure/benchmark a single sheet of copy paper and then a single sheet of a thicker paper or card stock. The white tile will measure 100% Opacity with the paper products reading less and copy paper less than the card stock.